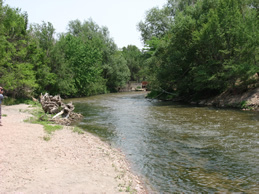 The Chilcott ditch or canal system diverts flows from the headgate located on Fountain Creek at the El Paso County Regional Park and traverses approximately 9.4 miles through the City of Fountain. The flows from the ditch terminate at the Callahan reservoir located on the JV Ranch. The ditch system consists of a combination of open ditch and closed pipe systems, the longest of which is a 1200 foot 42” siphon section that was constructed in 1942 and runs subsurface across Jimmy Camp Creek. The Chilcott Ditch Company was incorporated in 1874 and has supported as many as 17 different shareholders since inception. The shareholders were primarily comprised of irrigators that individually owned varying number shares of Chilcott water rights. The current shareholders continue to use the water for agricultural, augmentation, and municipal uses. The Ditch Company also provides conveyance of other water rights or “foreign waters” as a result of carriage agreements that were negotiated with various shareholders. The construction of the Chilcott Ditch in 1865 provided a conduit to deliver water for irrigation of farm and ranch land in southern El Paso County. The Chilcott water rights are some of the more senior rights on Fountain Creek with adjudicated appropriations dating back to 1866. The Chilcott Ditch was named in honor of George M. Chilcott, a Colorado pioneer, whose distinguished record of public service spanned some 28 years. Mr. Chilcott was appointed as the Register of the United Sates Land Office for the District of Colorado by President Abraham Lincoln in 1863. He also served as the Territorial Delegate of Colorado to the 40th United States Congress (1867). United States Senator for Colorado (1882-1884), State Senator (1884 – 1887). As a result of his contributions, efforts, and influence Colorado achieved statehood in 1876. Additional artifacts of Mr. Chilcott’s distinguished career and accomplishments can be found in the El Paso County Pioneer Museum and the National Archives in Washington, D.C. Copyright © 2019 Chilcott Ditch Company. All Rights Reserved.